The Neighborhood Farm Initiative interviewed members of Washington, DC's growing urban agriculture community to document the history of growing food in the city. 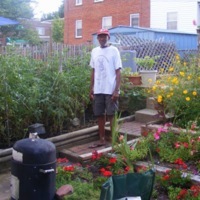 Harris discusses how his involvement with gardening transitioned from a hobby in the backyard of his house on Webster Street to managing the urban farm at Mamie D. Lee Elementary School. Copyright held jointly by the Humanities Council, the narrator, and the interviewer. Harris, Bennie and Lewis, Josh, “DC Gardeners Oral History Project - Bennie Harris,” DC Digital Museum, accessed April 22, 2019, https://wdchumanities.org/dcdm/items/show/1762.